LEXINGTON, Ky. (Jan. 17, 2019) — It may be cold outside, but we’re already thinking about warmer weather. Are you traveling for spring break and need a ride to the airport? 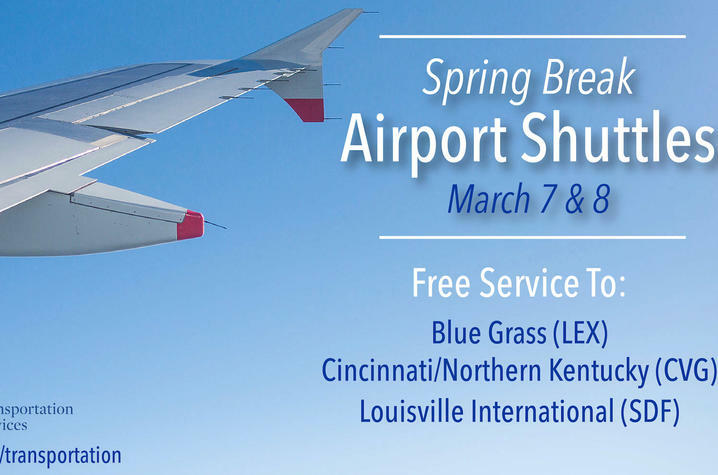 University of Kentucky Transportation Services is offering free airport shuttle service from Kroger Field to Blue Grass Airport (LEX), Louisville International Airport (SDF) and Cincinnati/Northern Kentucky International Airport (CVG) for spring break. Airport shuttle service is available to UK students, faculty and staff over a two-day period: Thursday, March 7, and Friday, March 8. Transportation Services, in partnership with the Student Transportation Fee Advisory Council, has recently added free shuttle service — as a one-year pilot program — to the Louisville and Cincinnati airports, in addition to the Lexington airport. Free return trips from all three airports are also available Sunday, March 17. More details about airport shuttles can be found here. Airport shuttles to all three airports will leave from Kroger Field every three hours Thursday, March 7, and Friday, March 8. Departures begin at 6 a.m., followed by 9 a.m., noon, 3 p.m. and 6 p.m. Riders should plan to arrive at their destination airport at least two hours before take-off. Registration for airport shuttle service is available online and must be requested at least one day in advance. For students who need assistance getting to Kroger Field, Transportation Services recommends using the on-campus Blue and White bus routes that run every 7-10 minutes. Riders should leave their residence halls 30-minutes prior to their airport shuttle departure time to ensure they have plenty of travel time. Information about the Blue and White routes can be found here. The Blue and White bus routes begin operation at 6:45 a.m., so students who need to catch a 6 a.m. airport shuttle bus will need an alternate form of transportation to Kroger Field. Contact Transportation Services for more details. Students who are taking advantage of free return trips from their respective airports on March 17 have the option of catching a shuttle every two hours: 10 a.m., noon, 2 p.m., 4 p.m., 6 p.m. and 8 p.m. Riders will be transported back to Kroger Field, where they can catch the Yellow Route for transportation to the broader campus. For more information on parking options and transportation alternatives, visit www.uky.edu/transportation. UK Transportation Services is also on Twitter @UKParking or tune into 1700 AM (WQKH 253) to hear daily campus parking and transportation updates. The station broadcasts 24 hours, seven d­­­­ays a week.